It was a very blustery day. The temperature was dropping and the chilly wind felt as though it blew right through to the bone. It took only a few moments outside before thoughts of a warm blanket and a hot bowl of stew began filling my head. I knew right then and there it was time to get out my big Dutch oven and start on a batch of Beef Goulash. The sizzle of bacon is the first sign of a great stew. Browning meat in the glorious rendered fat adds the most incredible flavor. It’s followed by aromatics of onion, garlic, toasted ground caraway, and the warming flavor of paprika. Then wine, broth, red peppers, and tomatoes join the pot to simmer for a while. Potatoes are added and cooked until tender. A final addition of sour cream comes right before being served up in big bowls. It’s pure comfort food at its finest. Then you could always follow up the meal with luscious dessert of Hot Fudge Pudding Cake. Beef Goulash does take some time to make. I looked out the window a few times and saw strong cold winds blowing through the trees. I thought about those who may not have a nice warm home or the ability to stand cook a stew. Elderly or those weak from illness may not have the stamina to make it from start to finish. This recipe for Beef Goulash makes a big batch and it freezes and re-heats wonderfully. It’s hearty and warms someone up from the inside out. The holiday season is a time of giving comfort. 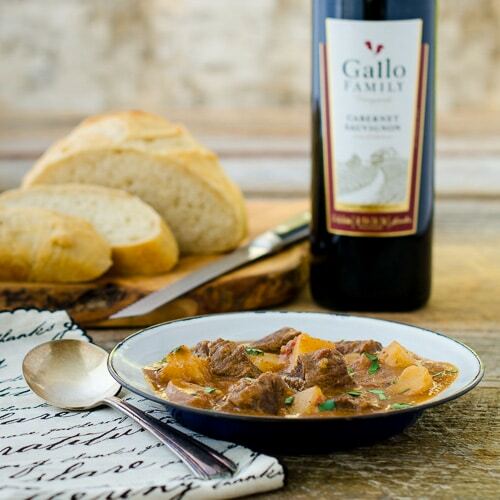 Sunday Supper is proud to partner with Gallo Family Vineyards sharing comforting recipes and wine pairings. You can make a meal for your family, friends, or to take to someone in need. Serve it with Gallo’s Cabernet Saugivnon or Pinot Grigio. There is a $1 off coupon or rebate available (depending on your area). Remember the corks are valuable! Gallo Family Vineyards will help feed needy families by donating $1 to Meals on Wheels (up to $50,000) for every one of their corks you send to them via mail or photo. For information click here: Every Cork Counts. 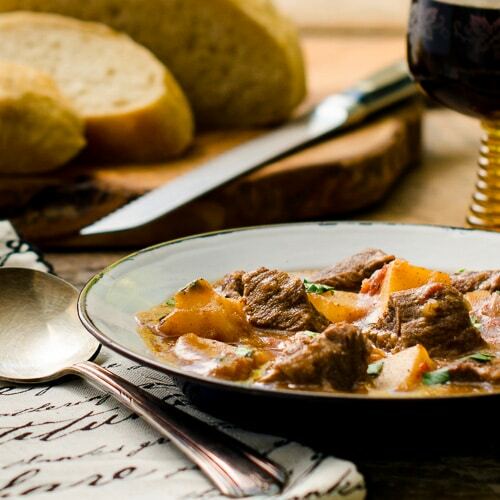 A recipe for Beef Goulash, a hearty and comforting stew originating in Europe. It's full of beef, potatoes, tomatoes, and warm spices of paprika and caraway. Toast the caraway seeds in a dry skillet over medium-high heat, about 2 to 3 minutes. Let cool to room temperature. Finely grind the seeds using a spice grinder or mortar and pestle. Brown the bacon pieces in a large (7 to 8-quart) Dutch oven or soup pot over medium-high. Transfer the cooked pieces to a plate using a slotted spoon. Crumble bacon after it has cooled. Sprinkle the beef with 1 teaspoon salt, pepper, and flour. Toss to coat beef cubes on all sides. Working in batches, add the beef to the pot and brown on all sides in the bacon fat over medium-high heat. Do not brown the beef all at once. Transfer browned beef to a plate. Add olive oil to the pot, 1 tablespoon at a time between batches if needed. Reduce heat to medium and add onions. Cook, stirring occasionally, until softened and translucent, about 5 minutes. Add garlic, stir, and cook until fragrant, about 1 minute. Add ground caraway seeds, paprika, and roasted red bell peppers. Stir to combine and cook for 3 minutes. Add remaining salt, vinegar, tomatoes, broth, wine, and browned beef. Stir to combine. Bring to a boil then reduce heat to a simmer. Cover and cook for 1 1/2 hours, stirring occasionally. Add potatoes and cooked bacon pieces. Stir to combine. Bring to a boil then reduce heat to a simmer. Partially cover and cook until potatoes are tender, about 30 to 45 minutes. Stir in sour cream. Garnish with chopped parsley when serving if desired. A stew that starts with bacon is sure to be a hit! Warm, comforting, tasty…it needs to be on MY table! This looks great, Renee! Saving this to try. Among other things would put a dent in the paprika I seem to have overbought! Pure comfort, right there in that bowl! 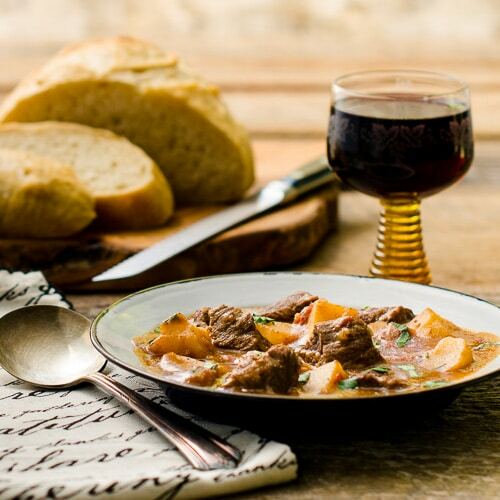 Stew is definitely one of those amazing comfort food dishes – yours looks like it would warm the body and the soul for sure! “The sizzle of bacon is the first sign of a great stew.” Amen, my friend! This looks amazing, Renee! I love Beef Goulash, but yours looks just incredible. Yum! This hearty stew is perfect for a cool winter day…even a semi-cool South Florida day! I totally agree with you, Renee, this is pure comfort food at its finest! My husband is going to be very happy when he sees this goulash on the table! Thanks for sharing this delicious recipe! I can’t wait to try it!! I can only imagine the amazing flavor that the addition of bacon adds to this dish! The flavors in this goulash have my mouth watering. And, I love that wine glass. It may take some time to make, but I am sure smelling it cooking is nearly as comforting as eating it! I LOVE Beef Goulash, I made it for the first time last Winter and my husband and I loved it, I can’t wait to give yours a whirl! Great comforting dish Renee! I always love your descriptions, Renee. You have such a way with words that even a BEEF dish sounds appealing to me! These photos are just beautiful, Renee! I just want to curl up with a blanket, and your lovely words and eat a big bowl of this goulash. These photos are seriously gorgeous. They make me want to cozy up with a bowl right now! Beautiful pictures of a perfect comfort meal, Renee! That looks so comforting and good. Of all the roasts and stews I’ve made, I’ve actually never made goulash. I think that needs to change ASAP! Kudos for making a goulash look beautiful! YUMMY! I love the type of recipe that warms you from the inside out…! This sounds fabulous and goulash is a favorite dish of mine! 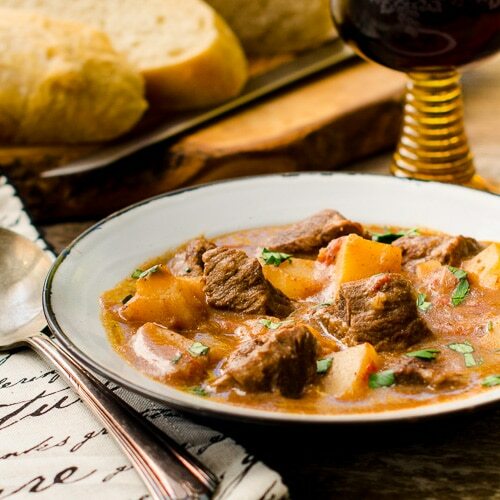 I love Goulash, this recipe is great. This time of the year, beef is on sale, and I plan to make some this weekend. I am eating that stew with my eyes first, and then digging right in! Your goulash looks like a warm bowl of comfort, Renee. It would be the perfect thing to freeze and bring to an elderly neighbor or relative. MY NEXT ME AL – IF I GET THE REST OF THIS RECIPE! What a gorgeous bowl of yumminess! !